It might come as a surprise to you that your fingernails can indicate your health status. But it is very true. The shape and color of your nails can be used to determine what is wrong with you. That is why medical doctors would examine your hands, with the palms facing downwards, when you are not well. They are actually checking the nails to see if they can make some preliminary diagnosis. How your fingernails can indicate your health status is mostly reflected in the unusual shape of the nail or discoloration in the nails. 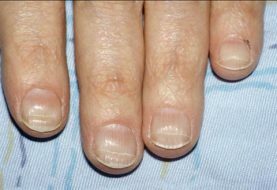 Uneven rough nails with several uneven tiny pits like minuscule potholes on the surface of the fingernails are closely associated with people with scaly patches on their skin. 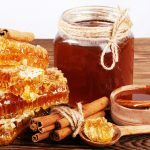 This condition, known as Psoriasis, is also an indication of connective tissue disorders and autoimmune diseases such as alopecia areata. Alopecia areata is notorious for causing hair loss in people. The problem takes time to develop. 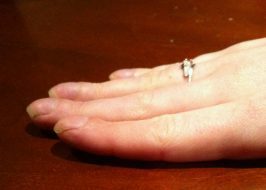 In clubbed nails, the tips of the fingers become enlarged while the fingertips curve over the tips as if sheltering the tips. 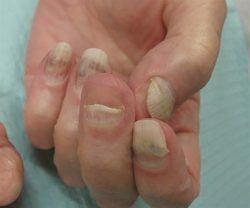 Nail clubbing could be indicative of lung diseases and low oxygen in the blood. Other health problems associated with nail clubbing include AIDS, Cardiovascular disease, inflammable bowels and bowel diseases. 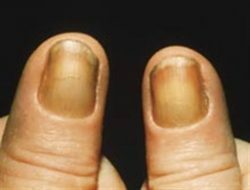 Also known as koilonychia, your nails look like there is a depression in the middle. Usually, the caved-in part is big enough to hold a tiny drop of water. 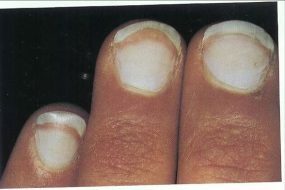 Aesthetically, spooned fingernails can indicate your health status simply by the fact that they look unhealthy. Apart from the aesthetics, they indicate either too much iron in your body or even iron deficiency, a form of anemia. Nails with a shape like this can also be a good indication of hypothyroidism which in turn can lead to some heart diseases. When the nails are completely white except for a narrow band at the top of the nail, it is known as Terry’s nails. The top part of the nail would have a different color from the white part. Terry’s nails can be as a result of the natural process of getting older. In other words, it shouldn’t be a cause for concern in old people. 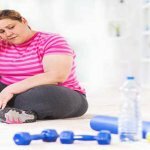 On the other hand, it could also be a sign that you have serious health problems like kidney failure, congestive heart failure, or diabetes. 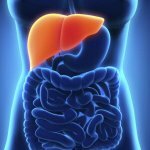 It could also point to the presence of a bad liver inside you. These are lines that can be seen stretching across the surface of the nail. Also known as beau’s lines, they divide the nail into two halves. They tend to appear when an injury to the nail or severe illness interrupts the growth of the nail, especially under the cuticle. In this problem, your nail becomes loose and given time and the right conditions, it would separate from the foundation holding it down to the finger. This part takes on a thick white, greenish or yellowish color. Detached nails are normally due to infections or injuries. 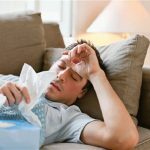 Adverse reactions to some drugs can cause this problem too. Diseases associated with the thyroid gland and psoriasis are known to cause detached nails too. In this condition, the growth of your yellow must have slowed down considerably, while taking on a yellow color at the same time. So these are the 7 important ways your fingernails can indicate your health status. The point here is to take measures when you notice any of these changes to your fingernails. And of course, your best bet is to see a doctor to undertake a thorough medical examination. Never treat any sign of unusual fingernails with levity. It could be your body telling you something is seriously wrong somewhere. So do the right thing and take action. Kindly share this with your friends on Facebook or Twitter. You could inadvertently help safeguard the health of several friends you haven’t seen in a while.